Life is tough enough! Easily finding something clean to wear that you love shouldn’t be! Want to do something really good for yourself now that you’ve survived another tax year? Here are three easy clutter-busting activities that won’t tax you and may end up saving you time and money! Dark colors including black, grey, navy or brown. Heavy items such as blankets. Contain three of the piles into a laundry sorter, bins or baskets and load the remaining pile in the laundry. While the first load is washing you can now attend to your clothes. Start by choosing the most overstuffed drawer in your dresser. Empty the contents into a pile on your bed, assuming it’s clear. If it’s covered in clothing include these too. If it’s covered in other items, remove them to a nearby table. You want to start with a clear surface. Start sorting items like with like. For example: Long sleeve shirts, t-shirts (single color) graphic t-shirts, sleeveless shirts, knit shirts, button down shirts, etc. If you have items you would never wear but have strong memories or sentimental value, put those in their own pile. 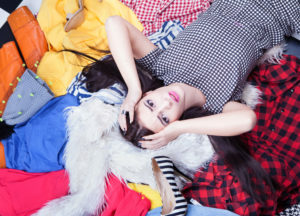 Once sorted, go through each pile, item by item and purge all items you don’t love, have not worn in over a year, are ripped, stained or would require too much work to restore – DO YOU REALLY WANT TO SPEND YOUR PRECIOUS TIME GETTING A STAIN OUT OF AN OLD T-SHIRT? Put the discarded items in a black trash bag. If you have great quality items you don’t want and still have tags on them, put those in a separate bag labeled “To Sell.” For sentimental items, take a picture of them and let them go or if you must, store them in a bin at the top of your closet with a label that reads: Stored on _____ date. Check to see if your first load of laundry is ready for the dryer and put the next load in and return to your pile of clothes. You should now have several piles of clothing you do want. If the drawer you emptied these from is large enough to contain them, without stuffing them in, begin folding or rolling them. I like the folding in thirds method so that items can be terraced together inside your drawer. Any button down blouses or shirts should hang in your closet. Place folded items inside your drawer, by type and if you like by color. You’ll love the way they look and it will be so easy to find what you need! Now go back, and check your laundry. Remove the first load from the dryer fill the second load. Fold your dry clothing however you are used to or use the folding in thirds method included above. 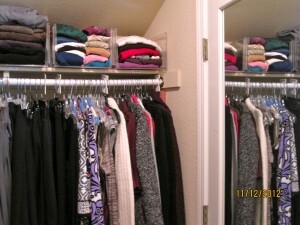 As above, remove all hanging items from your closet. Include, clothing, scarves, belts, and handbags. If you have a sturdy portable clothing rack, place the items on the rack. Otherwise use your bed to sort by color and type. Again, sort items like with like. For example. Long hang dresses/skirts, pants, jackets, long sleeve blouses, short sleeve blouses, better quality camisoles, large purses, small purses, small clutches, bags, belts and scarves. Resist the urge to purge things at this stage as you may end up tossing something you intended to keep. It’s also much easier to make a decision about what to edit when you are looking at “like” items. One by one, purge items as described above. Set aside clothing you prefer to gift to others just don’t contribute to their clutter as a tactic for holding on to things! Once edited, replace items hanging on wood hangers, cheap store hangers or slippery plastic hangers that take up a lot of real estate in your closet with non-slip, space saving hangers available at many stores. Store handbags in bins or on upper shelves. Use area below short hanging items for shoes. 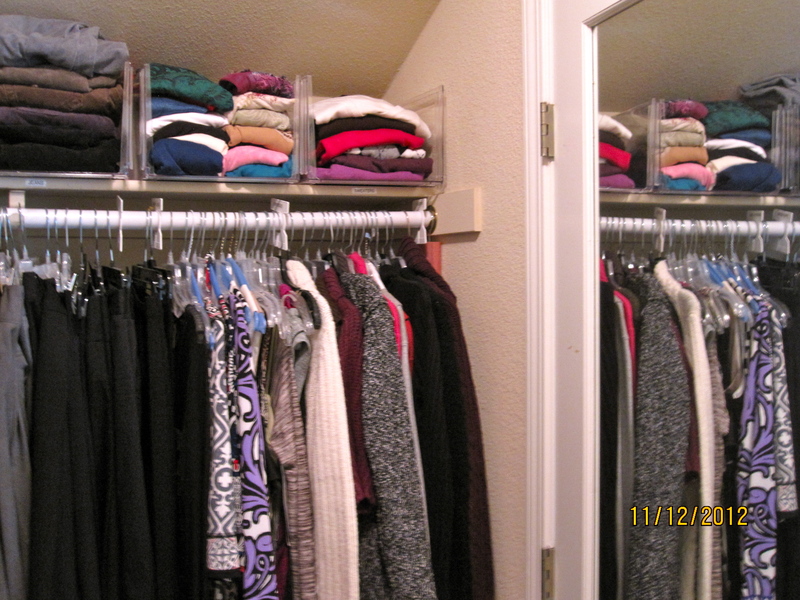 Space permitting, use bins to store heavier weight sweaters and scarves (as pictured). I recommend using labels for bins, even if they are translucent, to remind you and others what they do and don’t contain. Finally, return to your laundry to add in your final load in the washer and dryer. Remove folded clothes and return them to their rightful owner. If they are yours, you can now neatly return them to your newly organized drawer and closet. Now, sit back and admire your work! Tomorrow getting dressed will be a whole lot easier and definitely less stressful than your taxes! My friend and Yogini extraordinaire, Deborah Saliby, called me on Sunday asking for my advice. Deborah has been teaching Yoga for more than thirty years. There are a lot of Yoga teachers out there but relatively few hold the special certification that she does in Iyengar training. The certification signifies that she has undergone extensive training as an instructor in a particular method of Hatha Yoga called Iyengar, named for B.K.S. Iyengar, one of the foremost Yoga teachers in the world. Whenever I have a question about Yoga, I call Deborah. The moment I feel like my body, mind and spirit are crying out for a little restoration, Deborah is the first person I think of. On Sunday, however, after her class, Deborah’s mind and spirit were crying out for a different kind of restoration, in her home. I am grateful she called me. “but I’m not sure where to start.” She asked if I would mind sharing some of my professional organizing tips. “Of course,” I told her. I enjoy it when anyone calls me with a specific organizing question. To me if you are willing to ask the question, you are definitely in the mindset to get organized. As a professional organizer, the most common questions I get involve the how and where of organizing, as in “how do I do this?” or “where do I start?” Typically this follows an extended period of gradual awareness which eventually transforms into “I really wish my (fill in the blank) was more organized. But it’s not until the defining moment when the thought, “today is the day I’m going to do something about it,” that change can occur. For my friend Deborah that moment came after she got home from teaching one of the many Yoga classes she leads in Berkeley, California. 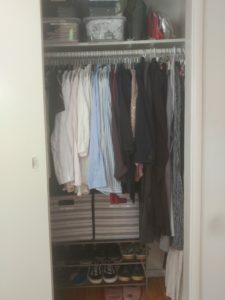 Deborah understood what was bothering her about her closet but even more she knew what organizing it would mean to her (not to anyone else) and she was motivated. Plus she had the added incentive of making a little extra money. I told her, “Yeah, you could sell all the clothes you don’t want anymore and with the money you make go out and buy new ones.” We both laughed. Before we hung up I told her to feel free to call me when she was done with the first closet. Even though Deborah was doing this for herself, I wanted her to know that I was interested in hearing about her progress. The next day, Deborah did call. She sounded really happy. She told me how she had followed my plan including emptying the entire closet first, sorting items by category, parting with what she no longer used, wore, or loved and got rid of things that brought in bad “mojo.” She reorganized the items she kept by type and color and put aside those things she plans to include in her sidewalk sale. In total it took her two hours. I was impressed. I offered Deborah some final tips about items she was still undecided about and suggested some ways to contain items on the shelves using what she already had around her house, before saying goodbye. After we hung up I went in to my living room and took a big breath and stretched. Thank you for that, Deborah. Have a question about organizing? Getting ready to move or start a home renovation project and need to get things packed, donated and organized? Call or email me. I promise you’ll come away with something you can use. As I told Deborah, I love to be a catalyst for change.